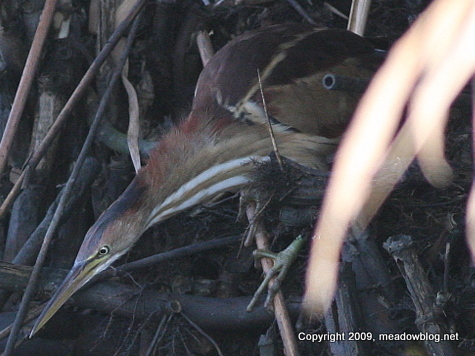 The Least Bittern, the Soras and plenty of primetime shorebirds continue at DeKorte. Water levels in the main impoundment should remain low for at least two more weekends. 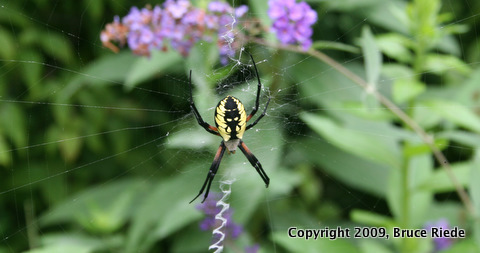 This spider was found in the Girls Scout Butterfly Garden in the Ridgefield Community Garden earlier this month, with bats, flying squirrels, and a doe and 2 fawns. Photo by Bruce Riede. Thanks, Bruce! This morning we had two Golden Plovers, Wilson's Phalarope, Least Bittern, and multiple Soras on view along Marsh Discovery Trail, plus White-rumped Sandpiper and Pectoral Sandpiper by the pump on Transco Trail. The lower water levels in the Shorebird Pool will remain for at least another 11 days, so come down to DeKorte and enjoy the great birding. As part of our Tuesday bird walk, we stopped by the Erie Landfill in North Arlington to watch NJMC naturalist Mike Newhouse band birds as part of a research project to see how birds use landfills during migration. 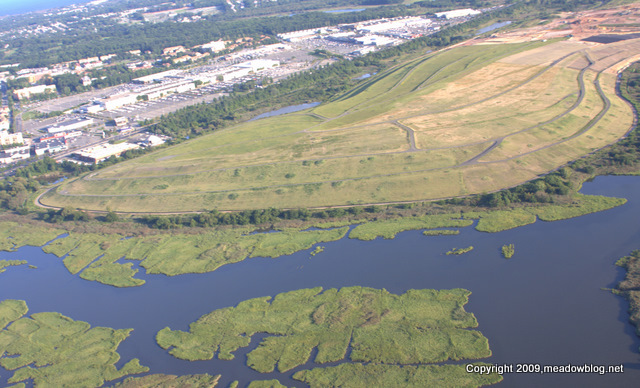 The Meadowlands Commission is especially interested in creating new habitat for endangered and threatened species. Mike banded one of the target birds, a Savannah Sparrow, on Tuesday. 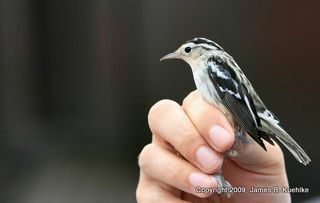 Click here for other meadowblog posts on bird-banding. The low wat er levels in the Shorebord Pool at DeKorte Park in Lyndhurst continue to attract good birds. Four Golden Plovers continue near the Transco Trail. Nearly continuous looks at Soras, a Wilson's Phalarope, two Long-billed Dowitchers,a nd a look at a Least Bittern along the Marsh Discovery Trail. 200+ Great and Snowy Egrets, plus yellowlegs and sandpipers galore. And did we mention the more than a dozen Black-crowned Night Herons? I walked the Marsh Discovery Trail this evening after work from about 6:40-7:30pm. 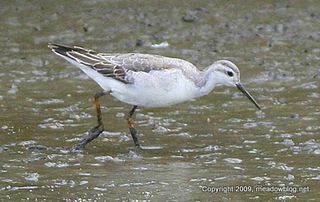 The Wilson's Phalarope (above, photo by Mike Wolfe)was standing with a couple of yellowlegs and clearly had the thinner bill, smaller than the other birds and lacking the streaking of a yellowlegs with a clear difference between the white throat and the gray neck. 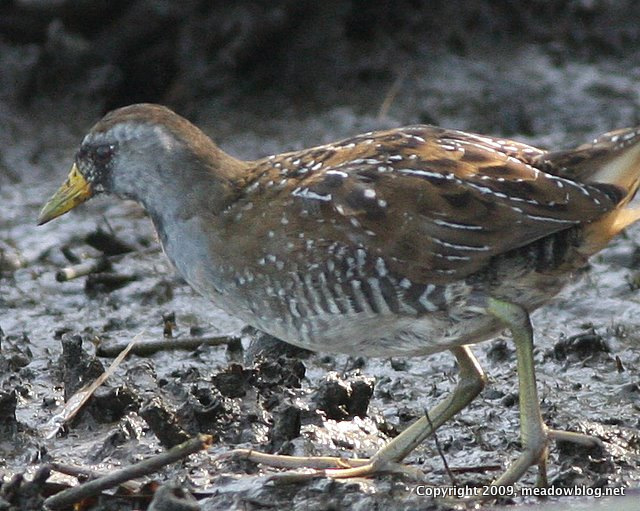 One sora was running around the phragmite "island" near the center. 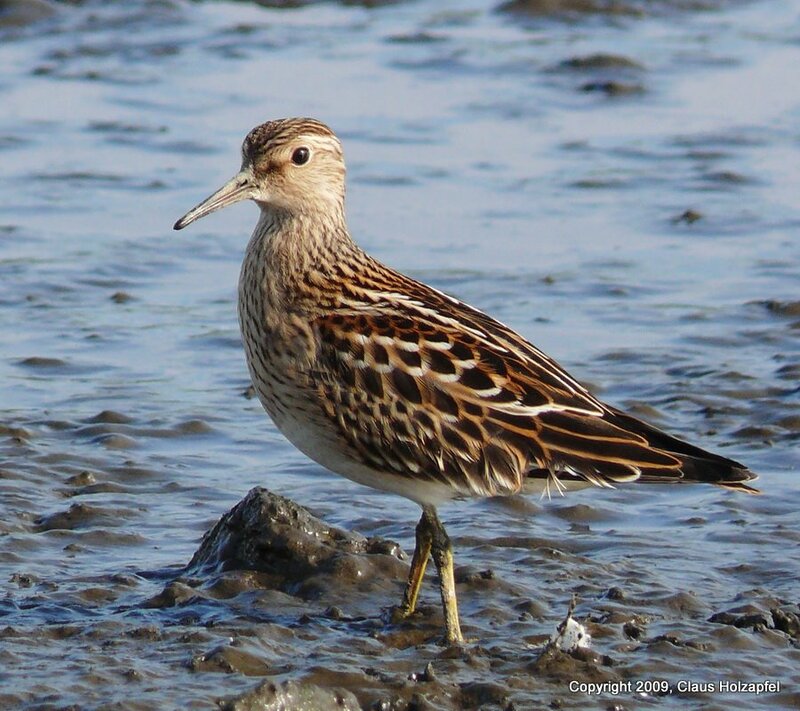 Pectoral sandpipers continued. It was also spider city. Tons of them putting out webs for the evening in some of the blinds and on the railings. I also had two raccoon cross over the train line and a skunk cross the road near the Marsh Discovery Trail. Birder Don DesJardines reports from yesterday's bird walk that the group's highlighst included four Golden Plovers and four Black-bellied Plovers. Click "Continue reading…" for Don's list. The Meadowlands Commission isn't the only agerncy in the region working wonders with former landfills. On Staten Island, the old Freshkills Landfill has been reborn as Freshkills Park. This Sunday, Freshkills Park is sponsoring a bird walk along the site's wetlands and creeks. The walk will be led by naturalists from the Staten Island Museum and park planners from the New York City Department of Parks & Recreation. It will be travelled both by bus and by foot. The tour will begin at 10:30 a.m. and will last about two hours. Space is limited. To register, please email freshkillspark@parks.nyc.gov with the subject heading “September Bird Tour” or call (212) 788-8277. 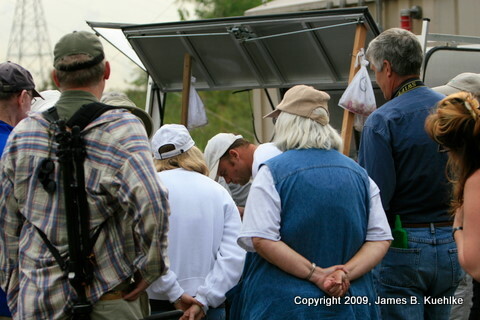 Birders are continuing to get great looks at Soras along the Marsh Discovery Trail at DeKorte Park in Lyndhurst. On Monday, you could also see the Wilson's Phalarope from the boardwalk, many Black-crowned Night Herons, Green-winged Teal, and plenty of shorebirds, including Pectoral and Stilt Sandpiper and Long-billed Dowitcher. Plus dozens upon dozens of egrets. 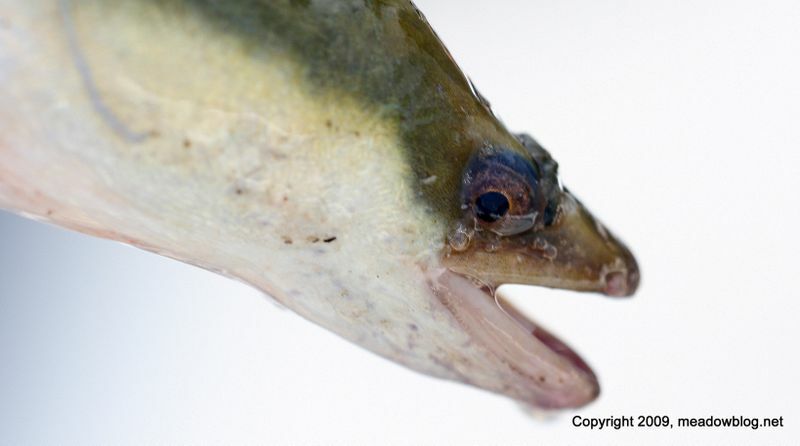 We got this guy out of the Hackensack River recently. Who is he? What do you think of this sort of Teaser? (Trying to take a break from the bird posts.) E-mail us here. Click "Continue reading for the answer and more info. 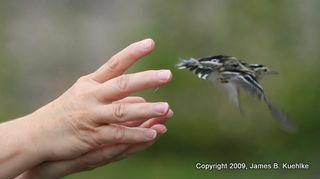 This special bird walk, sponsored by Bergen Audubon and the Meadowlands Commission, will be at 10 a.m. at Harrier Meadow in North Arlington, and (weather permitting) will feature a bird-banding demonstration by NJMC naturalist Mike Newhouse. 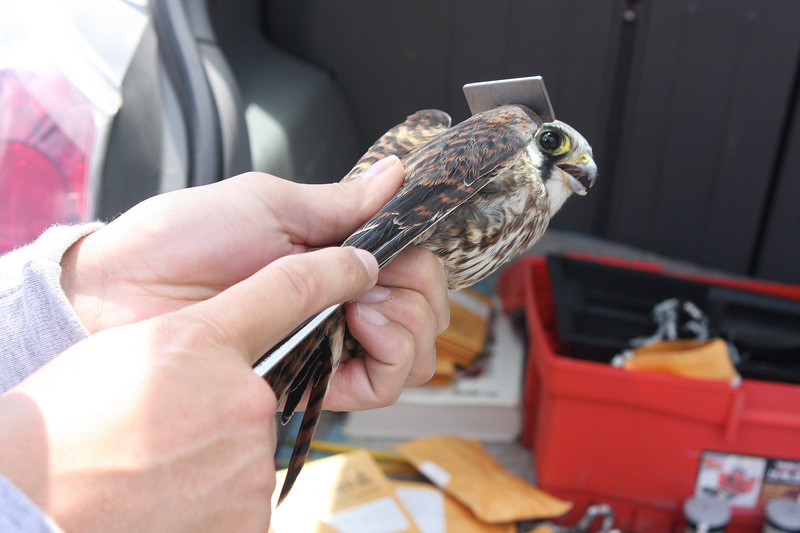 In the photo above, taken Friday, he was banding an American Kestrel. This free event starts at Harrier Meadow and runs from two hours. To rsvp, contact Don Torino of the BCAS at greatauk4@aol.com or 201-636-4022.